I should have OK'd this with you first G, but I was reading IAOFM and decided I wanted to post about our new #64 (the year I was born). Sorry if you had something already done on him. I can always take it down if you did. I like who we drafted this year and where we are headed as a team right now because of something we haven't had in many years, the foresight of drafting starters of the future. One of our picks I'm excited about is exactly that, a future starter. 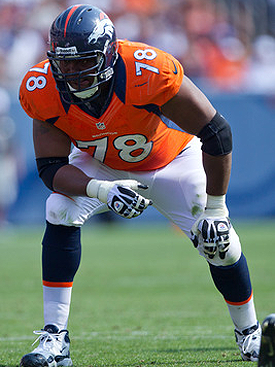 Taken at pick #108 in the fourth round by Denver, Phillip Blake played right tackle at Baylor when Broncos J.D. Walton was handling the center duties for the team. After Walton was drafted in the third round by Denver in 2010, Blake took over at center and was a second-team All-Big 12 pick by the Associated Press in 2010 and a first-team All-Big 12 selection in 2011. Will he take over at center again for Walton? Probably not this year. Was he drafted as a RT then, allowing Franklin to move inside? No. Even though he played there in college, he does not have the measurables (Combine numbers are a height of 6-2 1/4, 312 lb and 32-inch arms) or technique to be a starter there at the NFL level. Doc at IAOFM is someone whom I respect greatly as a football guru. Especially on his analysis of the OL. Here is his take on Blake. "Blake is highly effective if he gets his hands into a defender's numbers. If he fails to, he can be pushed backward. He is capable of re-anchoring, but he has to learn to maximize his technique - he's powerful, but he has 32-inch arms. That's somewhat short for the NFL, but it's hardly the kiss of death. Former Bronco Kory Lichtensteiger is still playing center for Washington, and his arms are only 30 3/8 inches long. Blake is fine there. As far as his ability to re-anchor, that Blake can squat 635 lbs says volumes about his potential ability there. This seems like a mantra of late, but it's also true that he needs to learn to drive from his core muscles. He's a solid run blocker, but pass protection is probably his forte. As noted, he's got a strong bubble and anchors very well - when he's pushed backwards, he's usually able to re-anchor, or he was at the college level. He's not the quickest player, but he does have a nice first step. If he uses it to fire into the defender using his core muscles he's very effective. When he fails to drive his hips, he can be redirected. He does stay low in short-yardage situations, but he doesn't have a history of pushing the pile as effectively as you'd think that he's capable of doing - whatever his age, he's mostly just lacking in pro-level training, conditioning, and the coaching of technique. When Blake's technique is on, he's a very effective player. When it's not, he loses battles more often." "There’s one thing about Blake that’s been debated in the reporting - he was dunned in his scouting reports as far as pulling goes, and he was criticized as having slow feet. I haven’t seen that - actually, he seems fairly smooth when pulling. It’s fair to say, though, that he sometimes struggles to find and maintain his target on the second level. Part of that is that he was in an up-tempo system at Baylor that didn’t suit him as well as it might. He does have a nice shotgun snap, and seems to have no trouble with the QB under center, either. The basics are there - skill, versatility, toughness, a willingness to be coached, and the raw power to turn into a quality NFL starter. 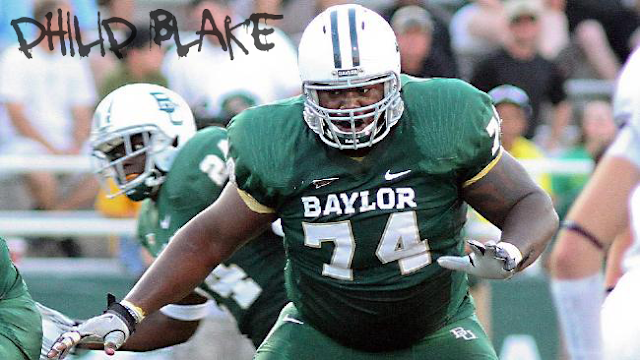 Despite having already finished his degree in sociology that summer, Blake decided to return to Baylor to develop his game before moving to the NFL. It was a good decision. To finish off his final season, Blake played an essential role for a Baylor Bears offensive unit that piled up 777 yards of total offense and posted 67 points in Baylor's Alamo Bowl victory over Washington. It was a game worth coming back for. Returning for an additional season after graduation permitted Blake to focus more intently on his football skills, and it shows. His invites to both the Senior Bowl and Combine were a testament to his hard work and intensity. Blake is older than all of our current starting offensive linemen except Chris Kuper. 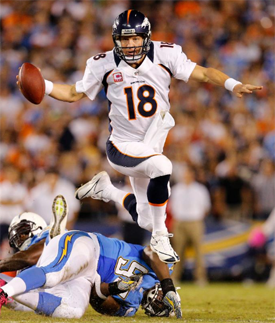 However, he does have six years of collegiate football experience, and that's going to help. He scored a 35 on the Wonderlic, and John Elway is impressed with his intelligence and football IQ, which is a requirement at center. Kuper is said to be recovering well from his gruesome injury. If he can return with the same capabilities as before is a big question mark. Blake would be able to start in Kupe's place until he is fully recovered if need be. Even if Blake doesn't start as a rookie, he is a starter in training. He'll push the guards and push Walton at center during TC to be at the top of their game. Blake is strictly to be considered as a interior OL backup at this point with huge potential to become a high quality starter if someone should go down like Kuper did last year. Something we very much needed IMO. Huge improvement over Hochstein. Blake started all 38 games he played in at Baylor – twelve at right offensive tackle and 26 at center…During that time, his total of 254 knockdown blocks and 48 touchdown-resulting blocks were the most for any interior blocker (guard and center) in the big Twelve Conference ranks…Along with Regina defensive tackle Akeem Hicks, Blake might hold the rare distinction among 2012 NFL Draft prospects for being the only players taken in the NFL phase that also were selected in the Canadian Football League Draft (Blake was the 23rd overall choice by the Montreal Alouettes in the 2011 CFL Draft). 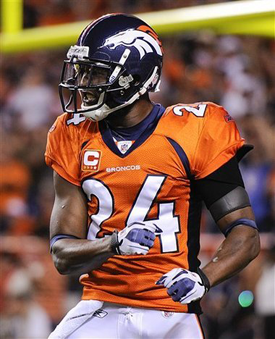 5.25 in the 40-yard dash…1.79 10-yard dash…2.90 20-yard dash…4.65 20-yard shuttle…7.86 three-cone drill…29 ½-inch vertical jump…8’9” broad jump…Bench pressed 225 pounds 22 times…635-pound squat…31 7/8-inch arm length…9 ¾- inch hands…78 ¼-inch wingspan. 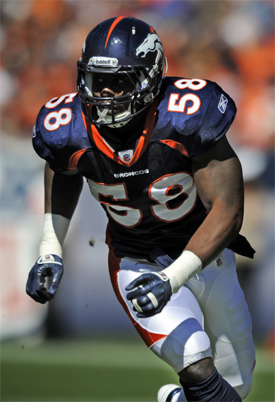 Blake graduated from Father Henry Carr Catholic Secondary School in Etobicoke, Ontario in 2005…Later played football as a center at Champlain Regional College in Lennoxville, Quebec, where he was a teammate of former Baylor linebacker Fred Plesius. Graduated from Baylor in August, 2011 with a degree in Sociology…Son of the late Llewellyn Blake and Patricia Blake…Selected 23rd overall in 2011 Canadian Football League Draft by Montreal Alouettes…Born Philip Anthony Blake on 11/27/85, in Toronto, Ontario, Canada. My only worry right now is getting the money for good seats... I'm a spender not a saver. You'd think for a Bronco game I'd be saving up money like crazy lol easier said than done. 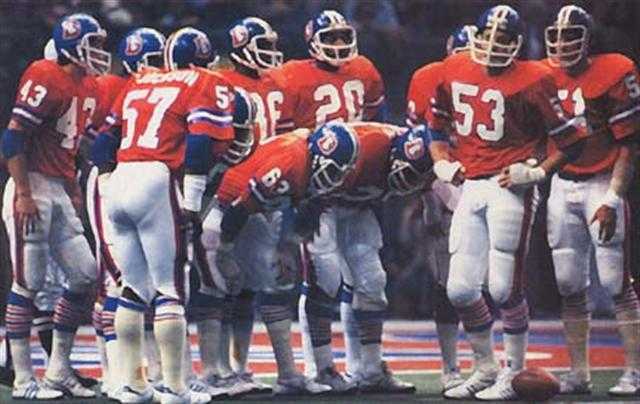 Plan is to go have a good time and enjoy watching Denver play in Denver. Cause like you said, I don't get the chance very much. Good read Digger... Your input and posts are always welcome. Nice to have someone other than Aussie or I post stuff on here. And just so you know I didn't overlook it Aussie... great bio on Derek Wolfe. Good info & good read. Didn't want your work to go unnoticed... you do most of it around here anyway. Nope that is cool Digger, I hadn't gotten to Blake so it is sweet as. I may clean up the post about, like layout and a few pictures if that is ok? No rush on the bio Princess, we have plenty of time for them. I have the Osweiler one pretty much done and will have it up at the end of the week I think. As for saving, don't you work all day and then sleep the rest and repeat that all week? Where do you find the time to spend all your money? Or are you one of those ladies that never has enough shoes, clothes, handbags etc. Thanks Princess for the kind words. Atleast some of the bigger ones like Wolfe are copy and paste. Oh and good read too Digger, thanks. There we go, new pic, cleaned up the paragraphs and whacked on a quick bio at the end. Wow Wayne Nunnely retired, I may do up a post on him. I have a lot of respect for Nunnely, he is a great defensive line coach.